The reason I love morning glory muffins is because you really can't go wrong with them! There are so many delicious combinations of ingredients that you can combine to make these muffins, but the key is to find nutrient dense ingredients that work well together. 1. Preheat oven to 350* and spray a muffin tin with cooking spray (I used Trader Joe's coconut oil cooking spray). 2. In a large bowl combine flour, baking soda, cinnamon, nutmeg, and salt. 3. In a different bowl add eggs and whip until combined. Add oil, vanilla, honey, and pumpkin. 4. Combine wet and dry ingredients. 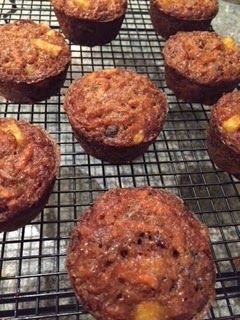 Stir in carrots, dates, apple, and raisins. 5. Divide between muffin cups and bake for 15-18 minutes. Should make 15 muffins.